If you’ve never tried building with someone else’s LEGO collection, I highly recommend it. Everyone organizes their collection a little differently. As a result, you’ll often see strange parts being stored together and inspiration will strike. Or, more likely, you’ll be unable to locate some of your go-to “comfort” pieces and be forced to try something new. Also, it’s just plain fun to build alongside your friends! 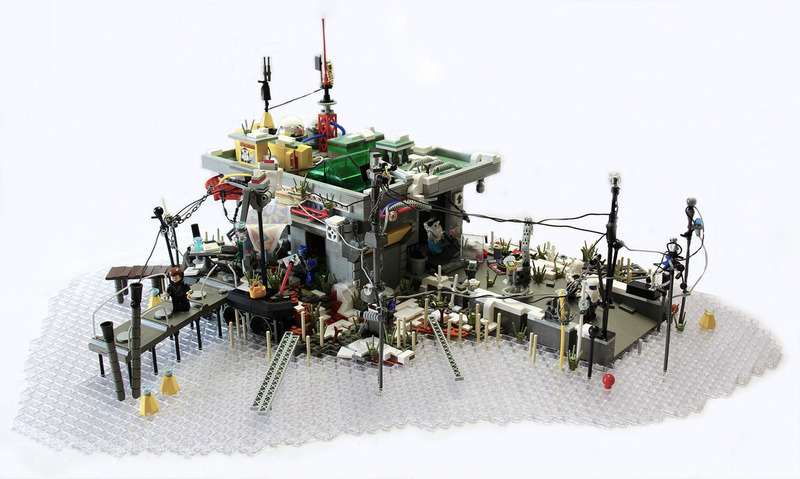 I’m not sure if Nooroyd learned any new tricks when he built this scene with his friend Andreas’ LEGO collection, but the result is stunning! The ramshackle building feels very organic and the cluttered composition draws the eye in several directions at once without being completely overwhelming. I particularly love the use of fabric, string, and tubing. Believe it or not, this blog has blogged such creations more often than you might think. Oh, nothing… Just pointing out a fun fact.